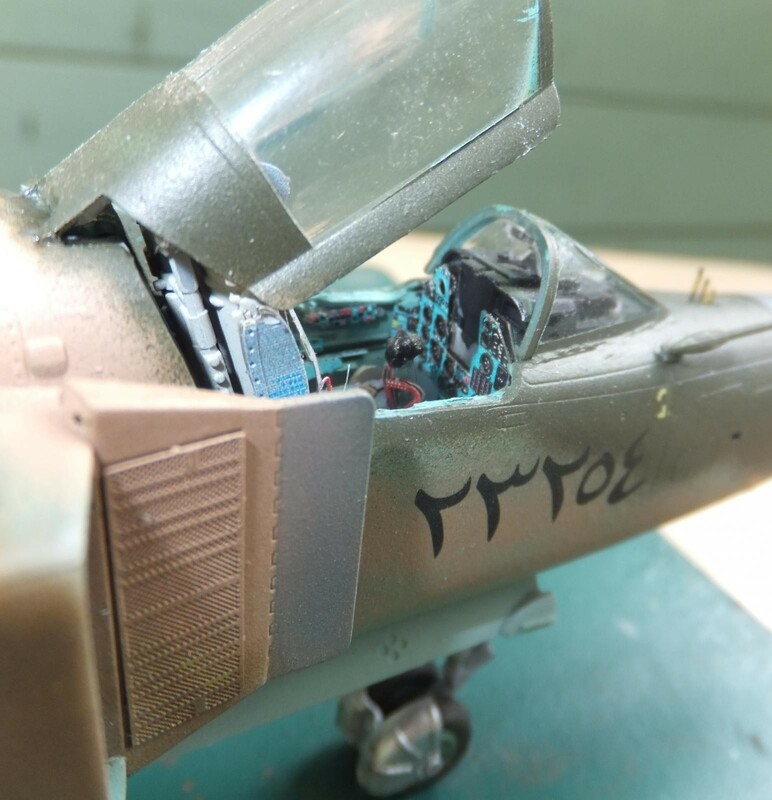 It’s 5:00 Am in late January, Capt Ahmad Al-Saladi is still contemplating what he and his brothers are about to partake. 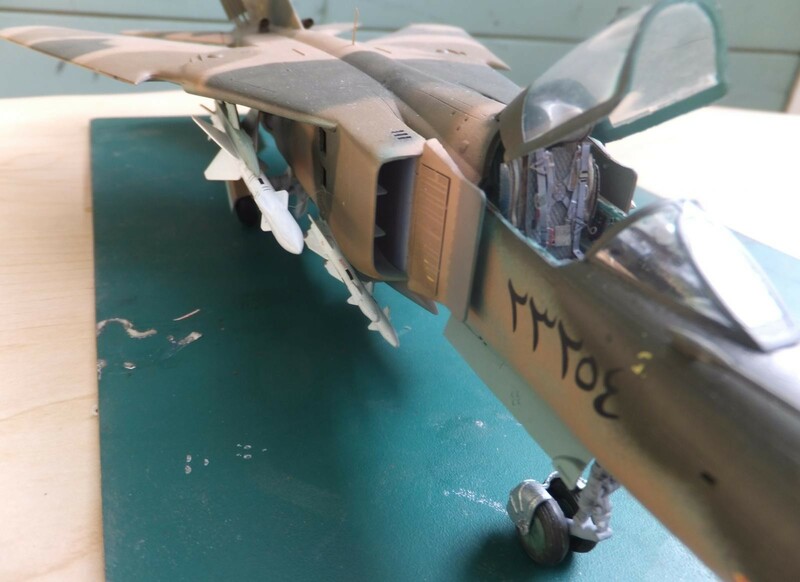 2 days prior the Iraqi Air force had launched a rather ambitious attack against coalition ground forces that had failed miserably with 2 Mirage F-1’s shot down by of all nations a Saudi F-15C. Humiliated and disgusted the Iraqi’s pretty much gave up hope of mounting any kind of air operations. With the U.S. led coalition forces now having complete air superiority. So arrogant and stubborn his superiors were thinking that we can defeat the American led coalition. Closing his eyes he remembers the 4 years attending Texas A&M and living among the Americans. That particular town so friendly and kind. Not the people as described by his aristocratic family and government. He knew deep down that if the Americans decided to side with the Saudi’s and provide defense for them it would be quite difficult to achieve the primary objective that Saddam had wished for. But as he prolonged the effort to continue and held up his combat operations as the American president demanded. We had lost the initiative. And yet his superiors still believed we can win this war. But from day 1, seeing his brothers fly into the skies and bounced by F-15’s, F-16’s,F/A-18’s and F-14’s everywhere they went and some never to return. 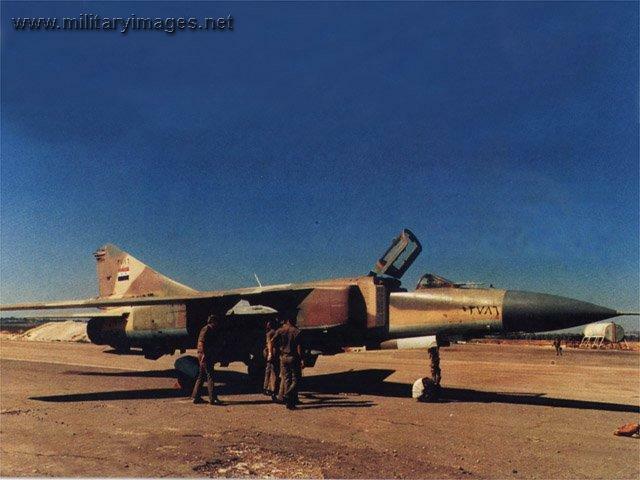 It was soon known by most that the Iraqi Air Force was no longer a factor and a threat. With command and control no longer able to direct combat aircraft to intercept threats in the air. The few missions conducted were basically on their own with no direction and they did not go well at all. So today the only alternative that was hotly debated among his superiors and his squadron was to run. The Americans suspected this but felt that if such an action should happen that the Iraqi’s would fly to Jordan who was friendly with Iraq. A wall of coalition combat aircraft were flying CAP in that airspace to guard for such an event. So the Iraqi’s threw a curve ball. The mission was to fly the other direction. To Iran, still dangerous but doable, a small window an opportunity to pull it off. The one time the coalition didn’t anticipate this. 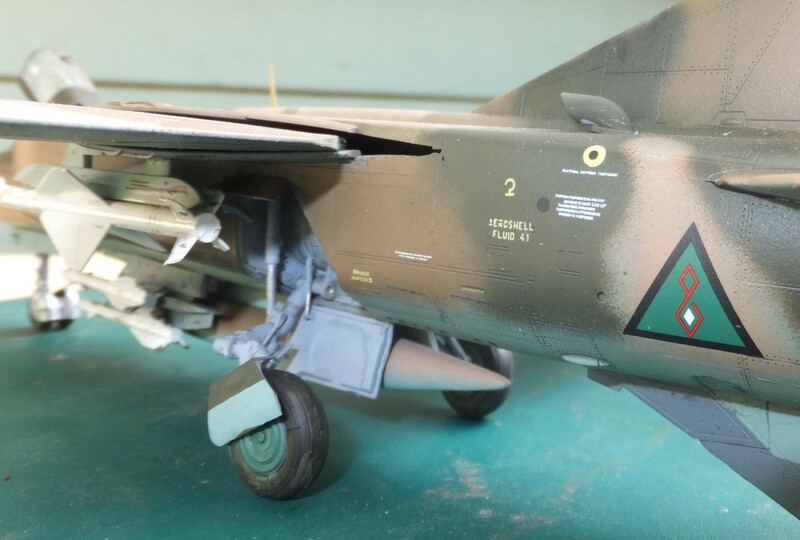 Capt Al-Saladi was torn, he was trained to fight, even if he was successful and reach Iranian air space, then get shot down by Iranian fighters. 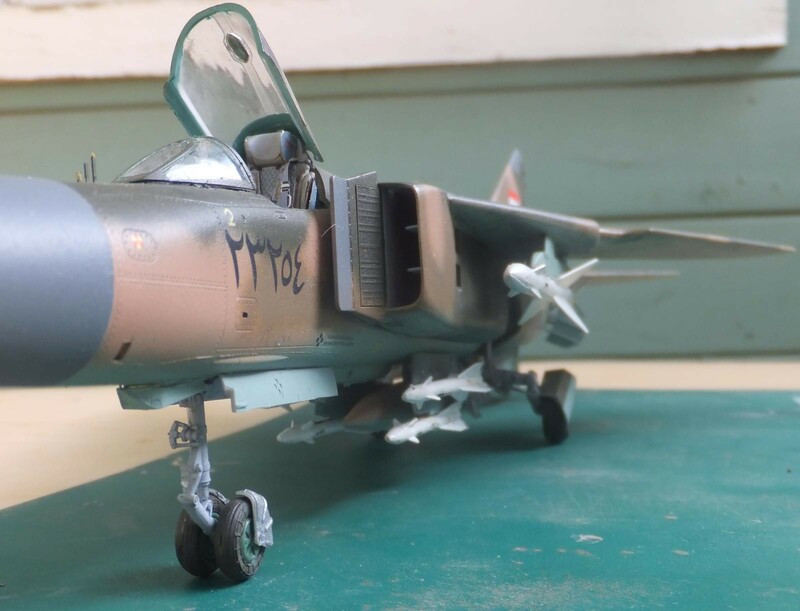 So armed with Apex and Aphid missiles for self defense he was flying his MiG-23ML, along with 18 other MiG-23’s, Su-22’s and MiG’21’s they were the first set to head off to Iran. Hoping to catch the Americans by surprise. 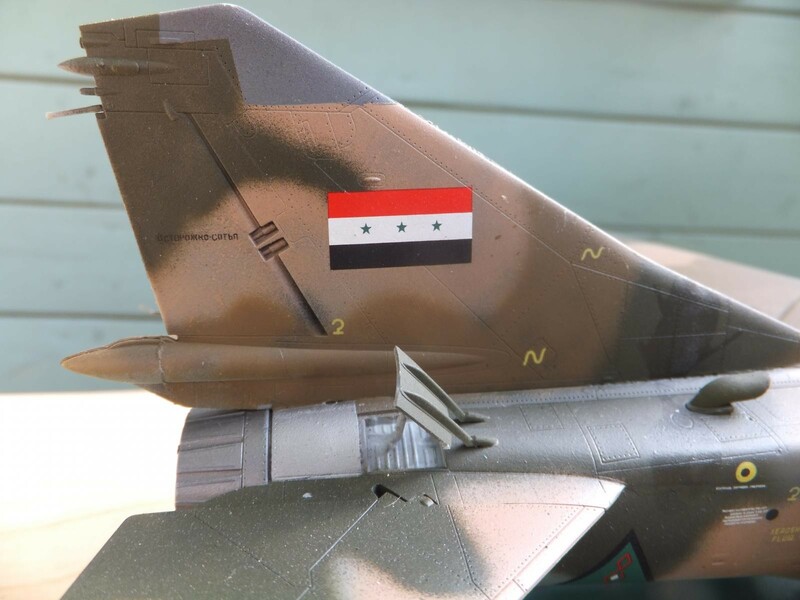 A diversion of MiG-29’s and Mirage F1EQ’s were launched towards Jordan. His flight soon after launched and staying low high tailed it towards Iran. Knowing the eyes of AWAC’s was everywhere. Still hopefully the diversion works and the coalition would be slow to react. To end the story the diversion worked and the first 19 aircraft did make it. 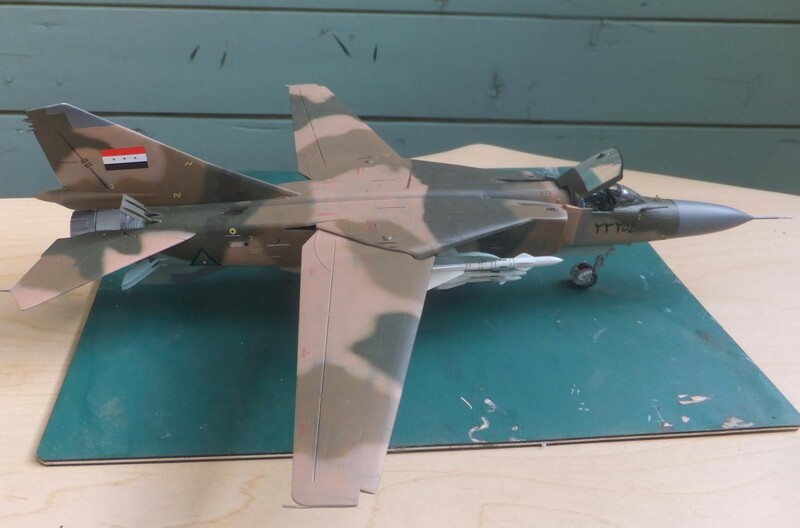 2 Saudi F-15C’s were directed to the escaping aircraft as well as 2 VFA-84 Tomcats which for some reason didn’t launch any AIM-54 Phoenix as they were able to get within range of the escaping Iraqi jets. 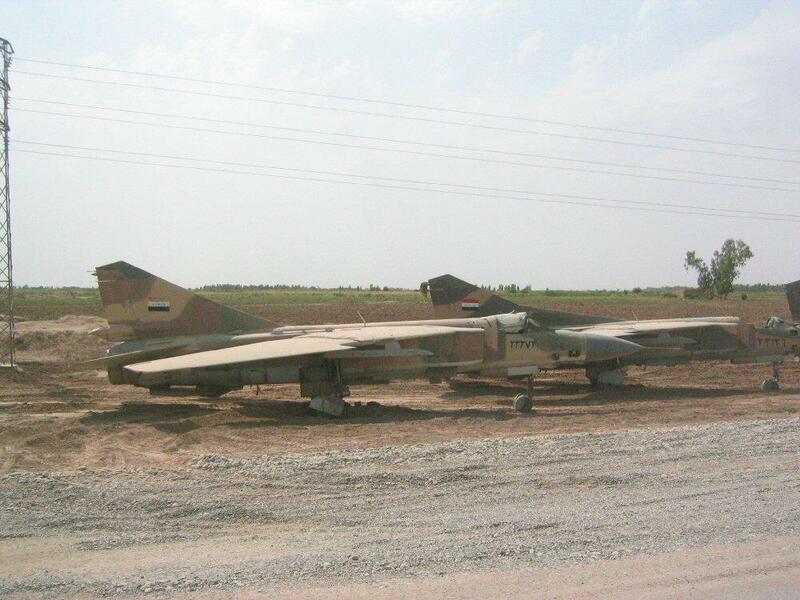 In the end Iraq managed to get over a 100 aircraft to Iran. 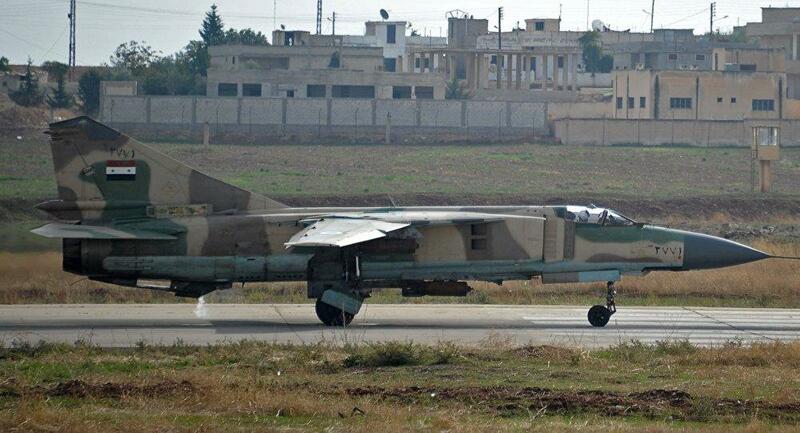 Except for a few Su-25’s that Iran returned back to Iraq recently. 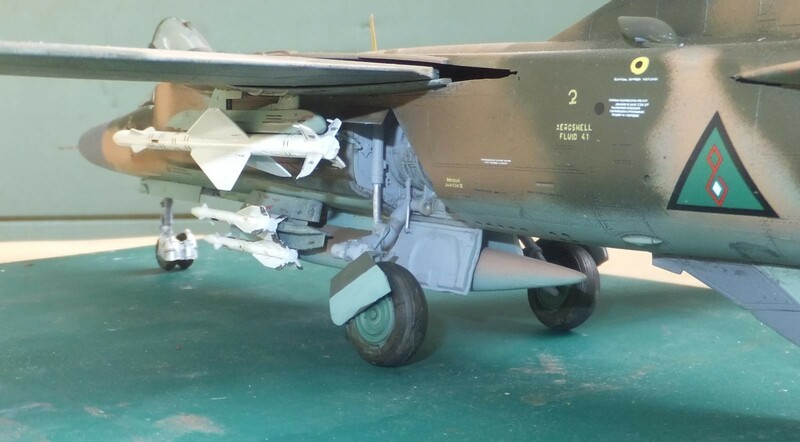 The rest of the aircraft were interned and kept by Iran. 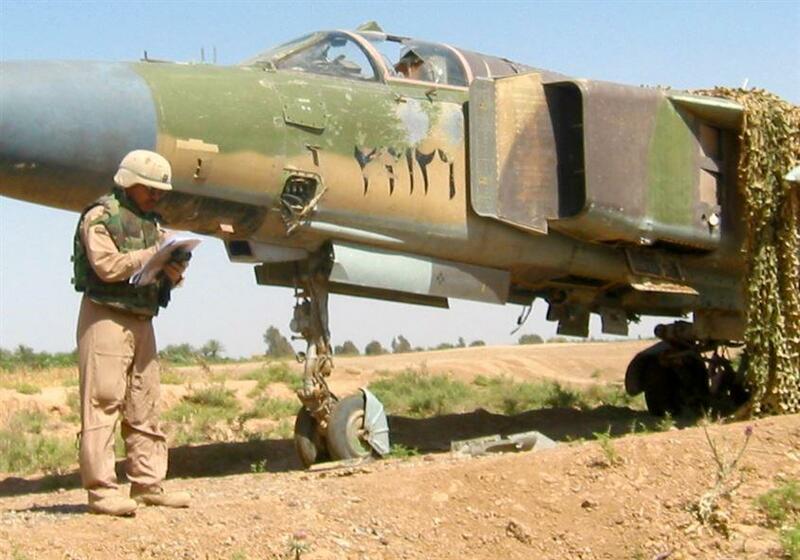 The pilots returned shortly after the war was over. 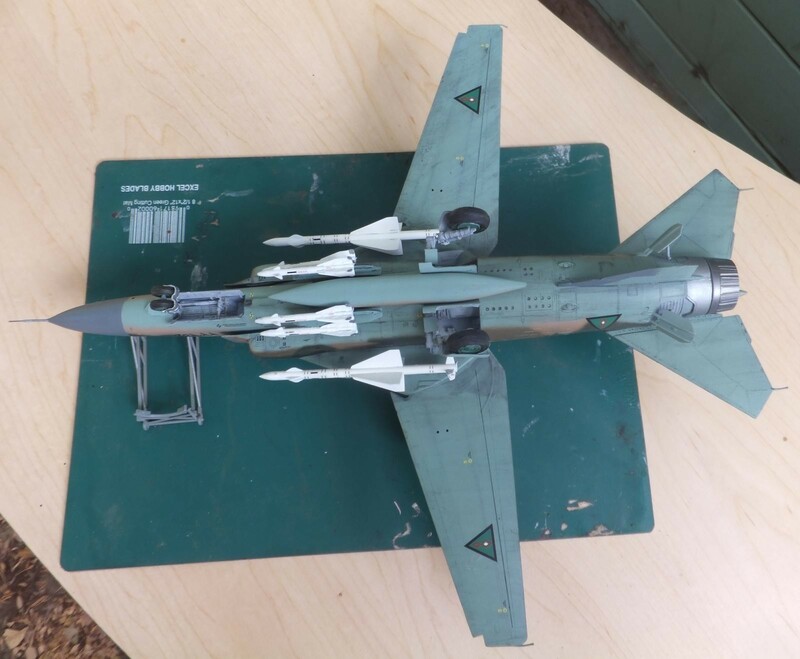 The Trumpeter kit despite all the bits and pieces was quite a nice challenge and fun to build. 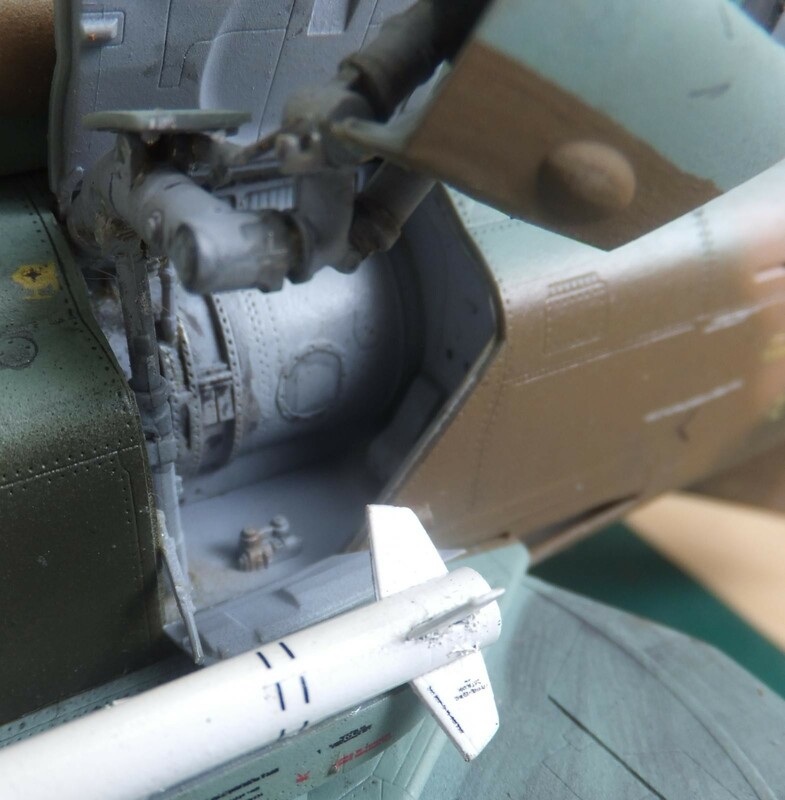 Being a swing wing also does provide a little complication to the engineering of the kit. 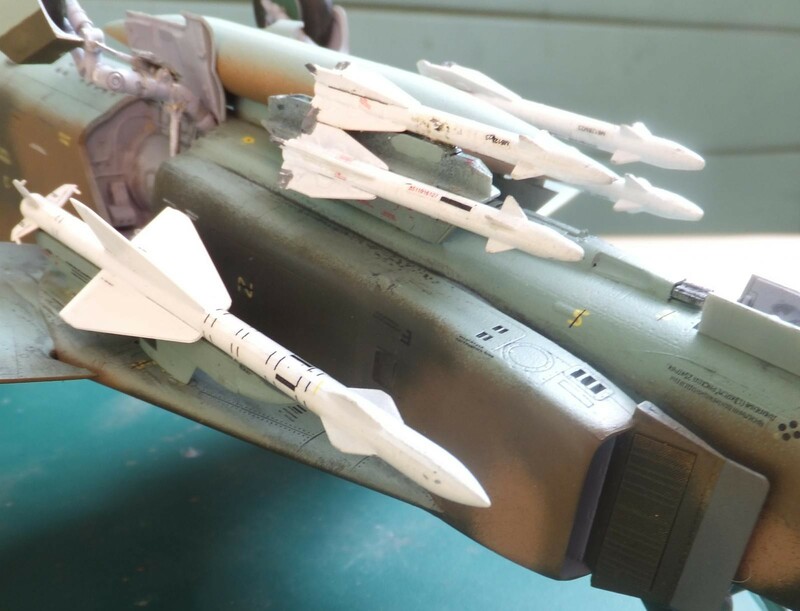 Using the old ESCI MiG-27 kit as a comparison, what a difference how basic it is. While the Trumpeter kit is a little over engineered as they are known for. 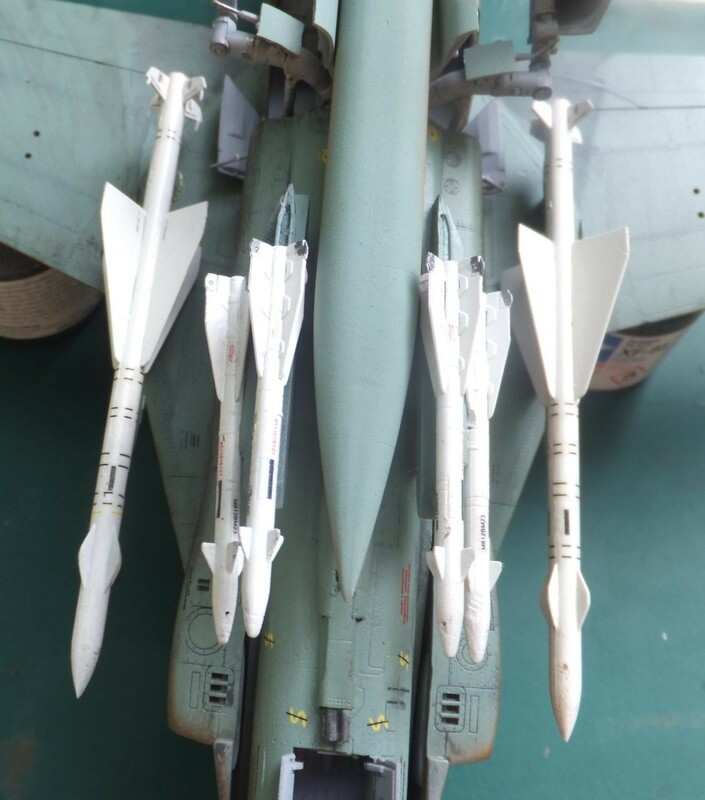 Missile pylons have multiple parts to make one. 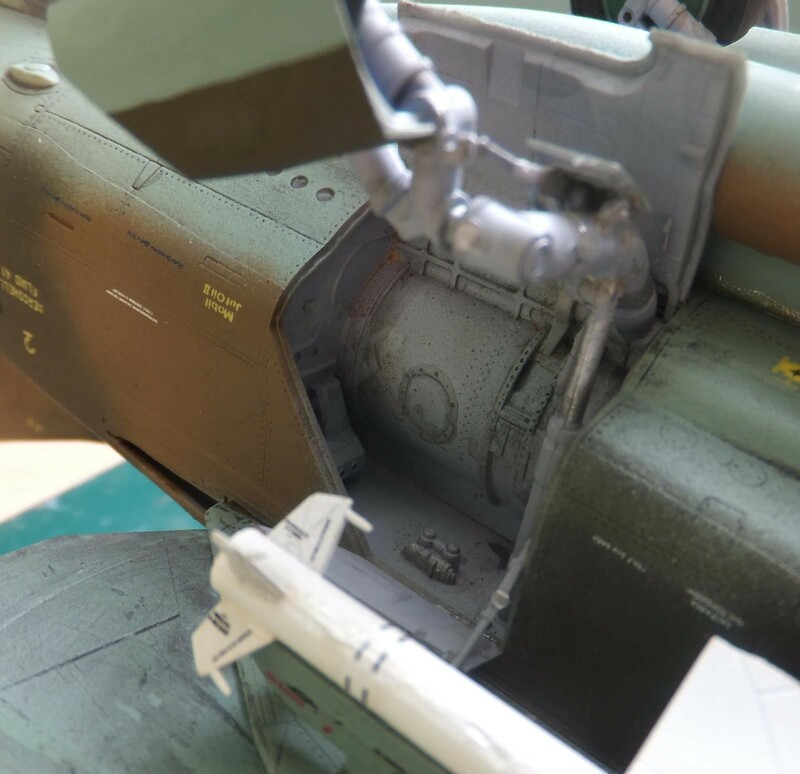 The cockpit is quite detailed and really enhanced with Eduard’s PE set. The kit itself provides PE as well. 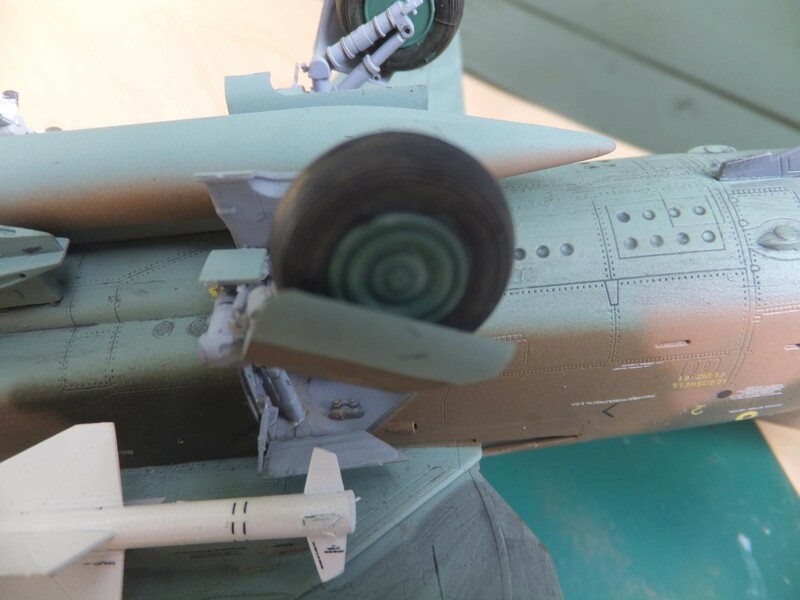 The main landing gear on the real aircraft is complicated, so is the one in the kit. Which is the only weak point. Which one of our Imodeler member did point out to take your time here as the attachment point is weak and will fail if not set correctly. Ask me how I know as I look at it right now and the RH main has already collapsed. 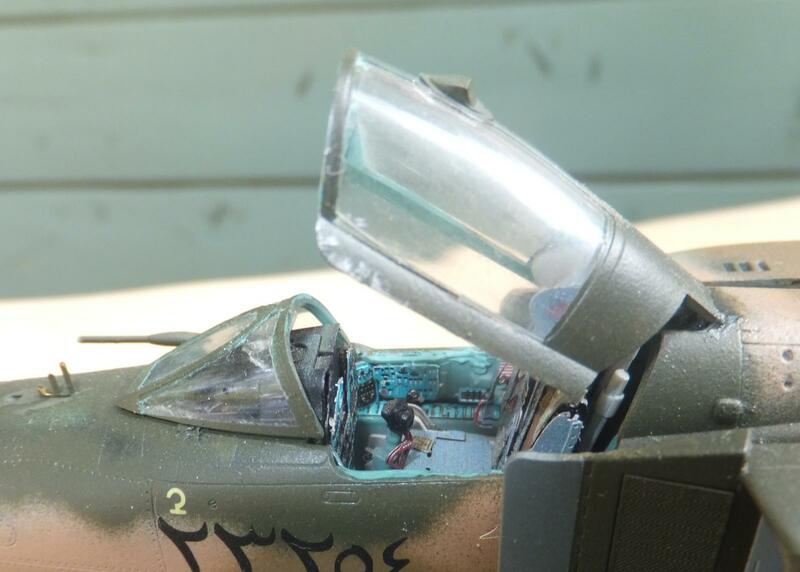 Aeromaster Acrylic Russian Interior Blue Green was used for the cockpit. 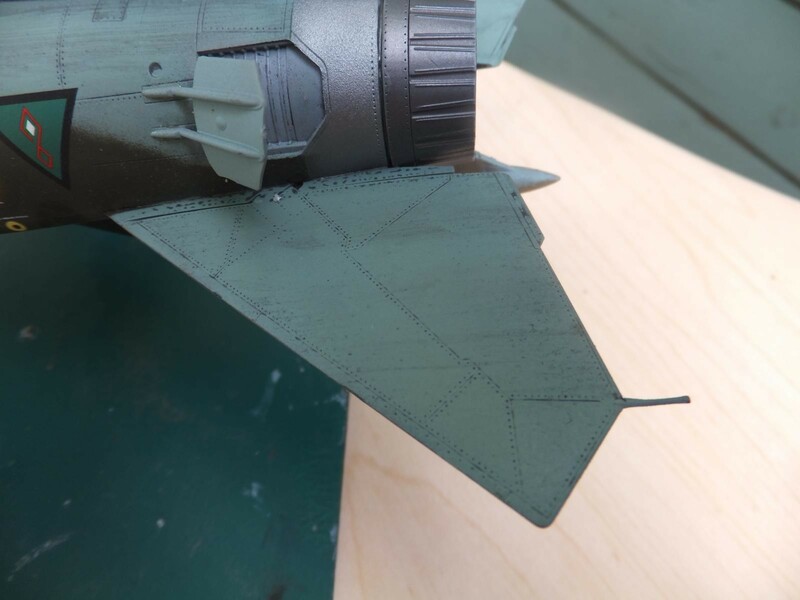 Aeromaster Light Grey for the landing gear bays, landing gear and doors was used. 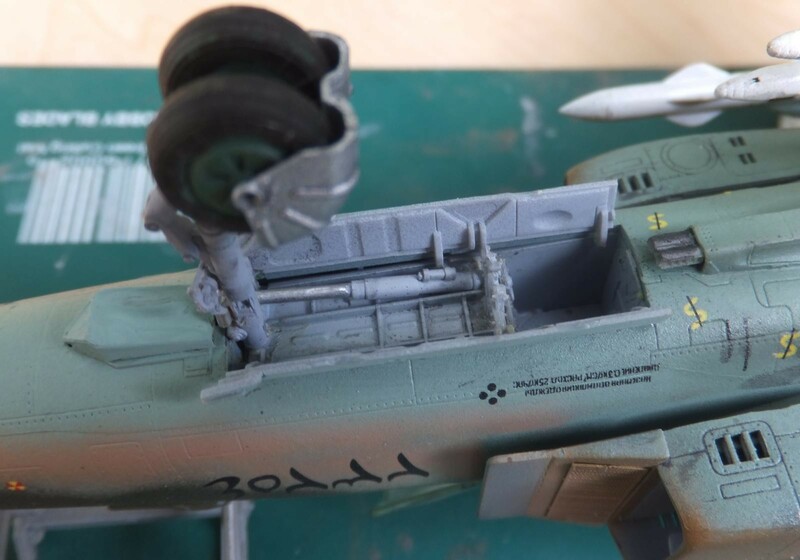 Aeromaster Russian Underside Lt Blue. 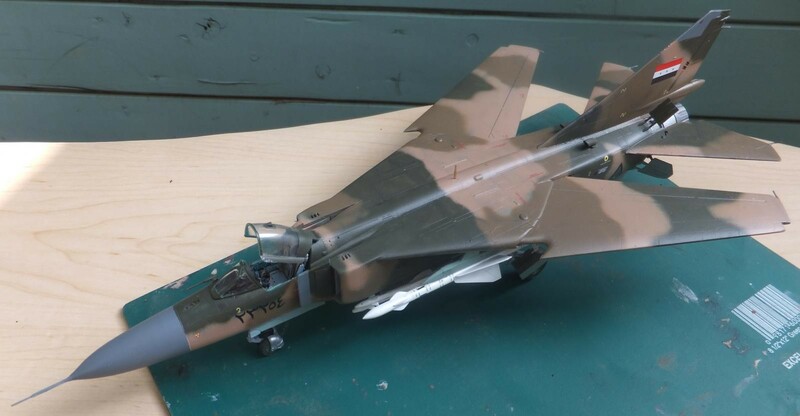 Polly Scale Tan, Tamiya Dk Green and Tamiya Dk Earth for the paint scheme. 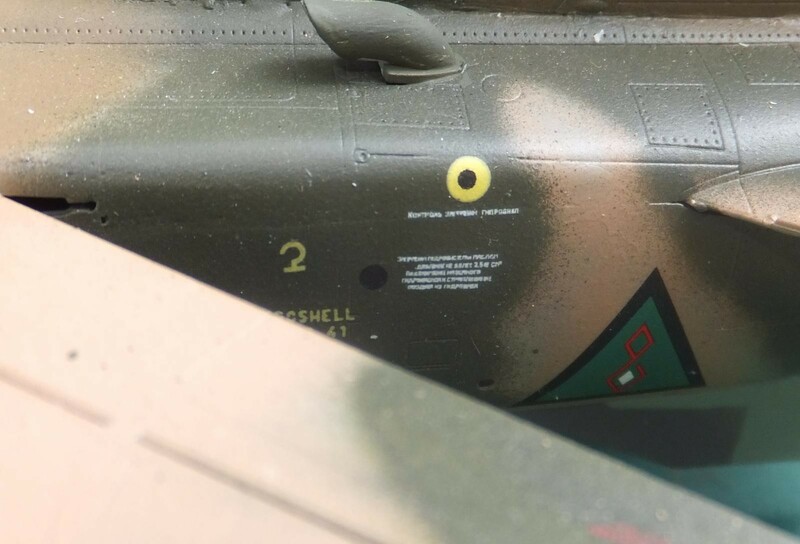 Linden Hill Iraqi Air Force decal set provided the markings. Overall a fun and fulfilling build. 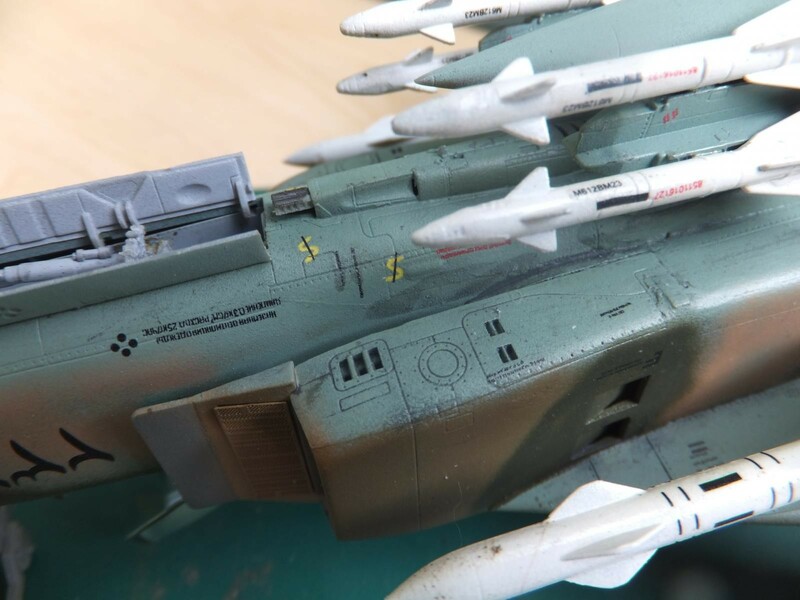 The kit provides a complete set of stencils which can make an F-4 look like it don’t have any. It took 2 weekends to apply all the markings and I didn’t use all of them. The name of the pilot is fiction and his thoughts are entirely mine. But the scenario is true. No one can know what his thoughts were, my vision is what I know and what took place in January 1991. This I do know, a combat pilot is a combat pilot no matter who he flies for. 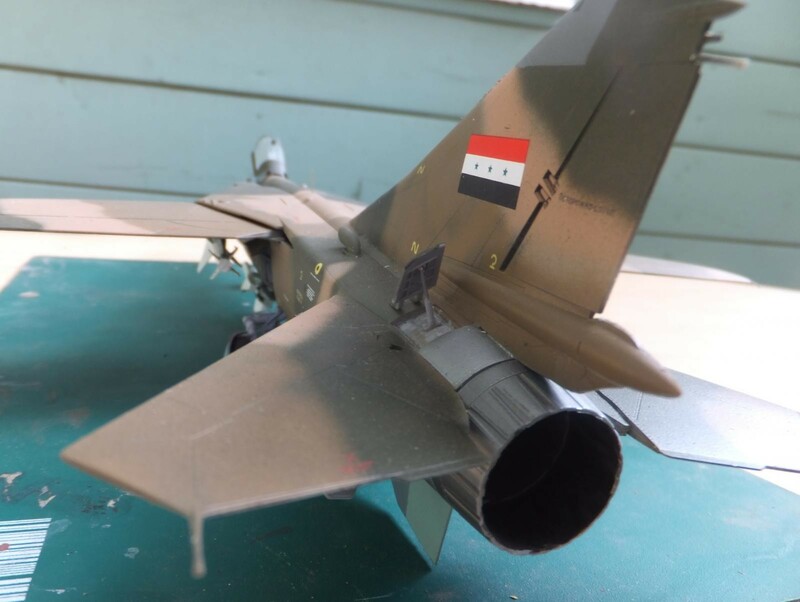 He is trained to fight, and if he is like any aviator that is gifted to fly a jet, that its sole purpose is to bring death and destruction to the enemy then his thoughts are like mine. We fight to win no matter the circumstances. Thanks for viewing. Nicely done Chuck, and the story is a good bonus as well. 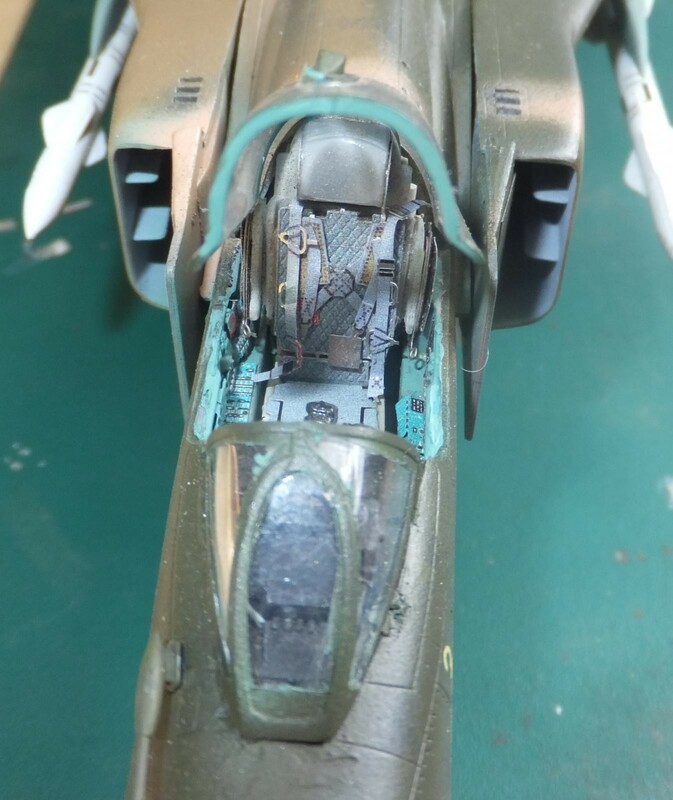 That cockpit really looks great. Job well done, and as mentioned above, the story makes it complete. 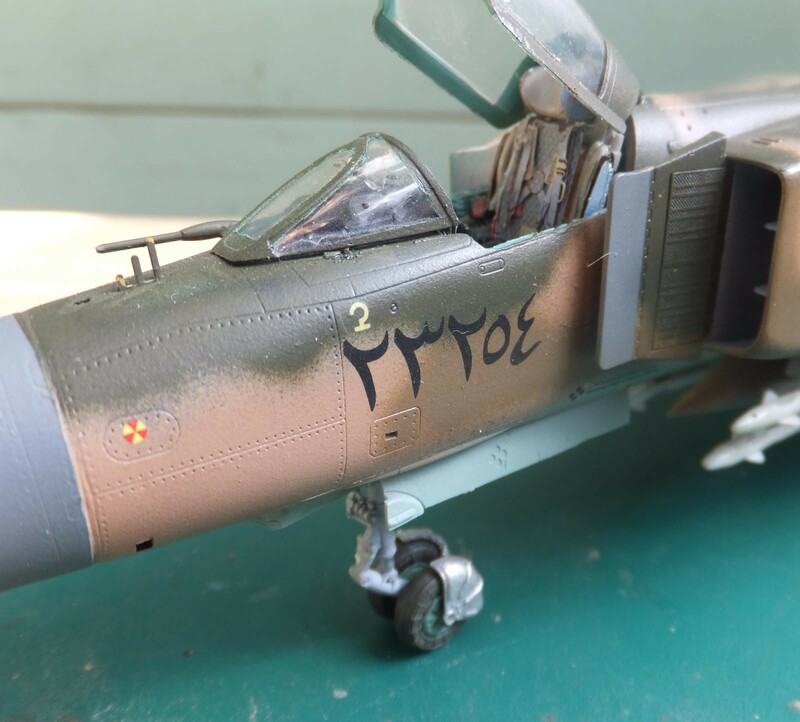 I try to give each model some character and purpose with little history. 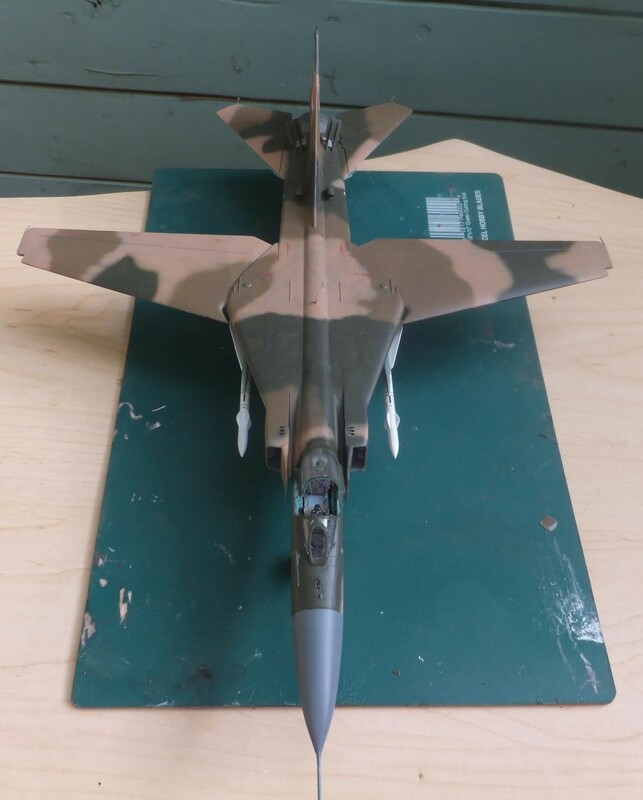 Well built MIG Chuck and an interesting, if fictional character story. Thanks Jeff it was fun with the expected challenges. Very nice! 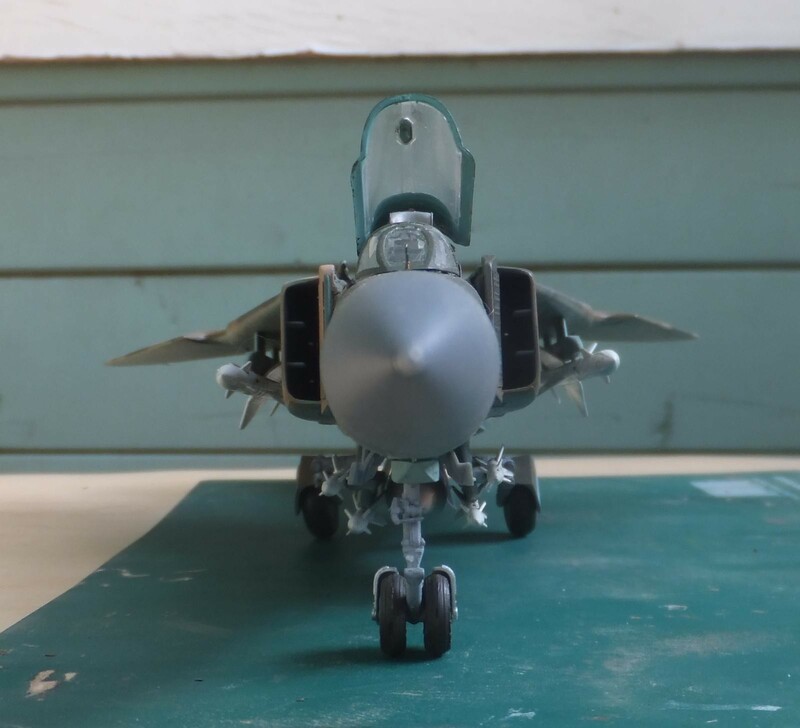 One of my favorite Soviet aircraft. Thanks Anthony, I appreciate that. I really need to replace my old Hobbycraft Flogger with this one. It looks much better when completed. 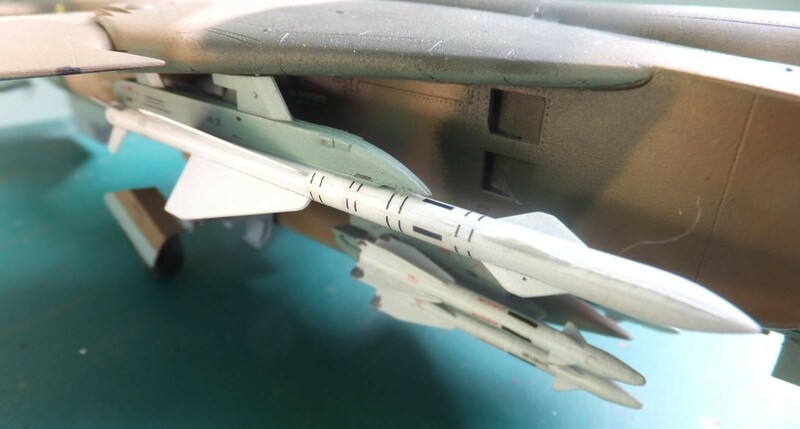 (The Academy MiG-21 is also nice and the Hind is still a REALLY nice kit!) They look great sitting together! 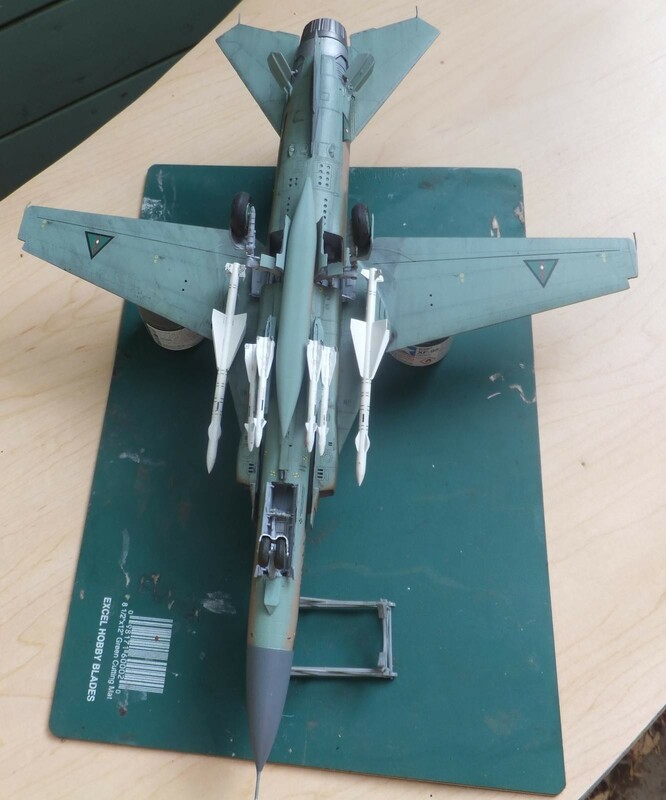 Thanks Josh, I forgot about the Hobbycraft Flogger, it may be a repop of the Esci kit. 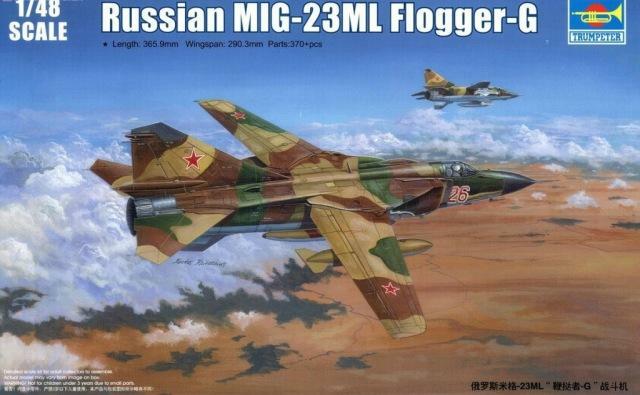 It is the Academy MiG-21 and the Revell-Monogram Hind. From time to time I will get a couple of other builds together for comparison. Yeah. 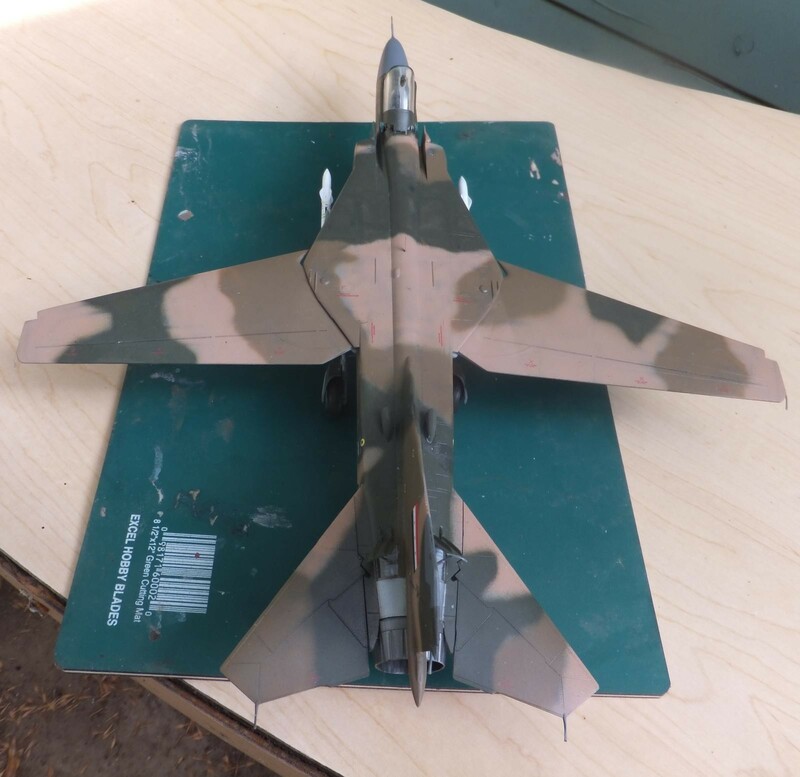 I built a Hind in 1993 and loved it. Picked up a new one when it was re-released. 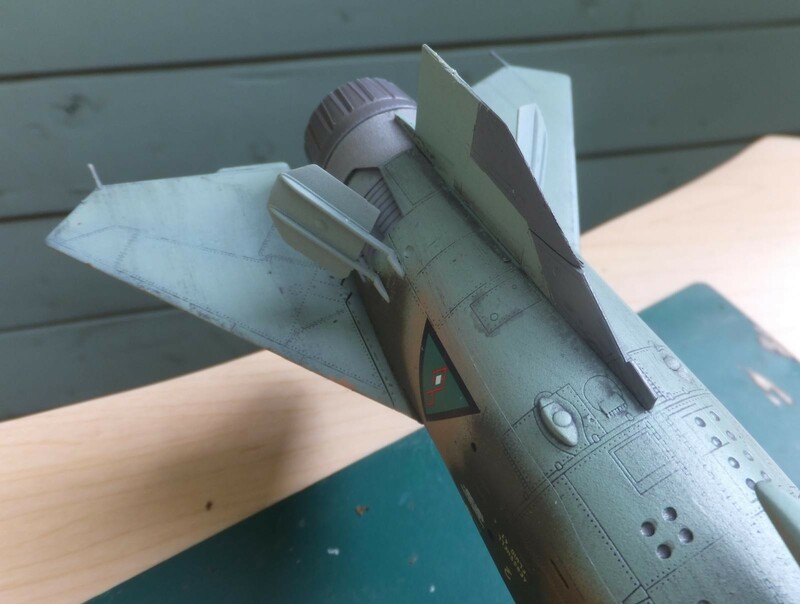 Just need to find Soviet markings, don’t want to do a Polish one. I’d rather have that big red star on the side. 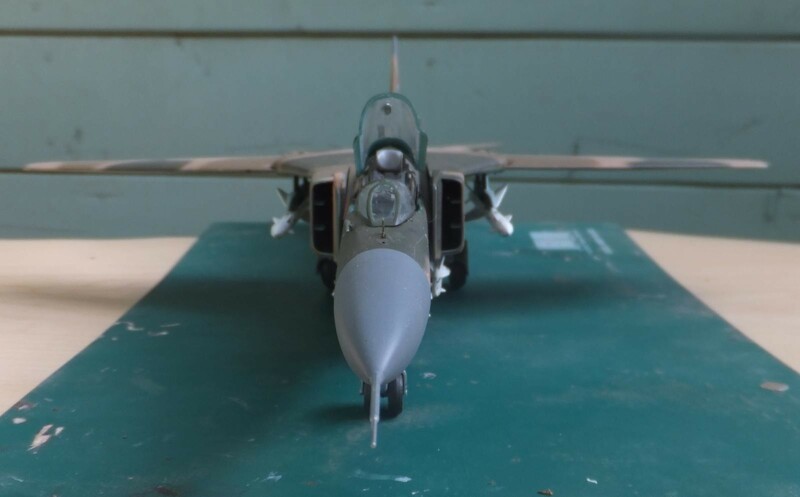 Good story and some awesome pictures of your Mig Chuck. I like it ……….. Thanks Louis, and Merry Christmas to you and the family, I appreciate that. This is great Chuck – I learned new things – loved the story. Somewhere out there pilots were facing this dilemma and you have put it into words in a really thought-provoking way! Thank you. The build matches the story – I really like how different it is. Love it! Thanks Paul, you know it is one thing to be told to retreat and come back to fight another day. 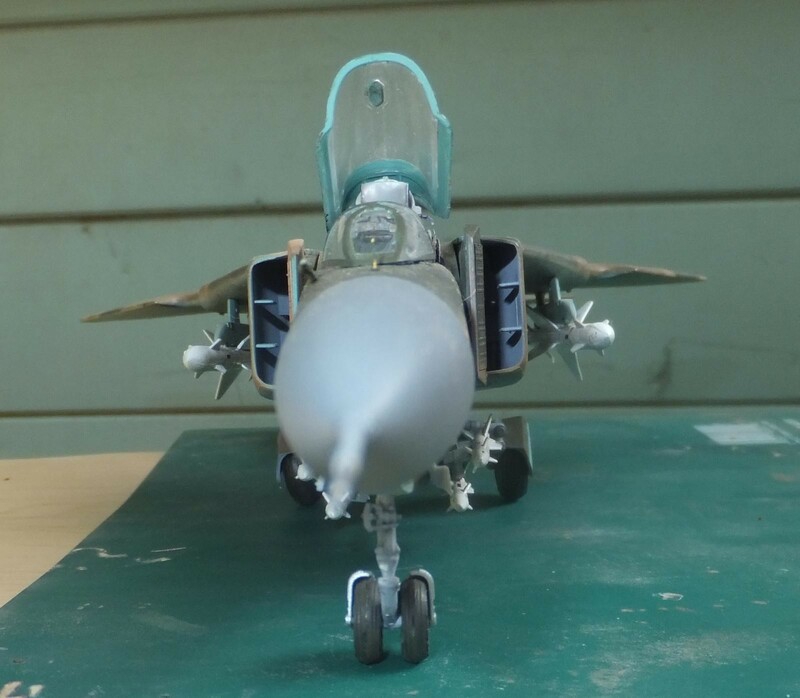 But it is another to be told that you are going to turn perfectly good combat aircraft and give them up. That would not sit well with most anyone with fight in them, so I’m sure to be given an order to do just that was tough to swallow even if there was little hope. But time again we faced such dire situations in our own history short as it is. And found a way to prevail and win. Such is American resolve. Very nice build and also the story to it is one of a kind. Congratulations with this Flogger! Thank you Michel, i appreciate your words and your work as well. Nice build. 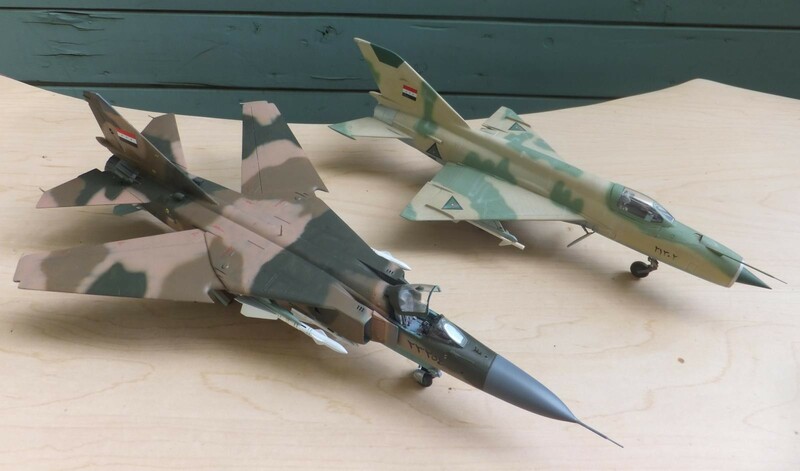 Who gave you the info that two VF-84 F-14As were in range to shoot the fleeing MiGs and Sukhois?